In addition, iOS 8.4 update also includes bug fixed an issue where users receive a specific series of Unicode characters causes iOS device reboot last month, fixes an issue that prevented GPS accessories from providing location data, and fixes an issue where deleted Apple Watch apps could re-install. 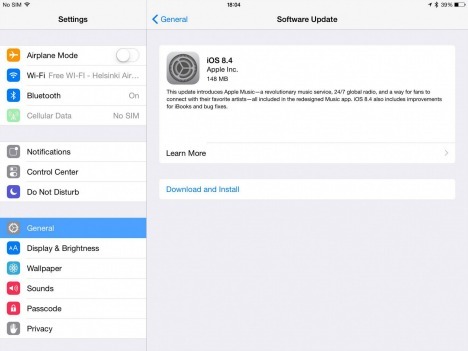 iOS 8.4 is available immediately as an over-the-air download, or update by going to Software Update and download to iOS devices. iOS users just head over to Settings > General > Software Update to download the iOS 8.4 OTA, or download the IPSW files from the links below.